Last week, CHS updated you on the latest project to come out of the Liberty family — Good Citizen will open on E Olive Way later this year. Another son of Liberty is also hard at work building something new. “We’re not taking out art, we’re putting in science,” Nik Virrey tells CHS. For those who seek a thoughtfully executed cocktail or espresso on Capitol Hill, Virrey should be a familiar face. A longtime bartender at Liberty Bar and Tavern Law, Virrey relishes in the opportunity to provide his customers with a superb liquid experience, not just a drink. He’s building a company to help others do the same. He and business partner Brandon Weaver are growing Matte&Gloss, a Capitol Hill-based consulting company that seeks to infuse a shot of mindfulness into America’s coffee and bar culture. Virrey says the coffee industry has for too long relied on tribal knowledge instead of a rigorous approach to running a cafe. The discipline starts with having a barista with a commanding presence of their space. Virrey said Capitol Hill is among the best places to see this connoisseur approach to coffee, with cafes like Liberty and Broadcast leading the way. Matte&Gloss derives much of its inspiration from Danny Meyer’s bestselling book Setting the Table, and it’s easy to see why. In his book Meyer lays out how as a 27-year-old he started with a small neighborhood cafe in New York City and turned it into a small empire of influential restaurants through his brand of hyper-hospitality. Perhaps then it is not surprising that the first major Matte&Gloss effort will be a book outlining Virrey and Weaver’s consulting approach. Matte&Gloss consulting activities have thus far focused primarily on corporate events and helping to curate a bar in Las Vegas. While they have not yet worked with clients on Capitol Hill, Virrey said plans are in the works. Virrey is also the manager of Slate Coffee in Ballard, which had its start last year in a Airstream trailer parked at 14th and Madison. 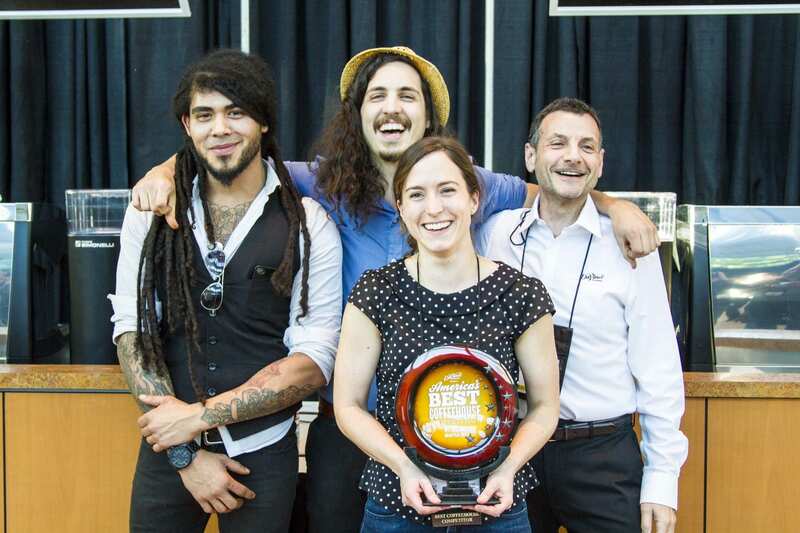 Last year the humble cafe won America’s Best Coffeehouse Competition in Seattle. In an industry that has served as a reliable source of jobs for the inexperienced transplant 20-somethigns, Meyer says managers should put a premium on hiring and paying for exceptional staff. To provide a superb customer experience, Virrey also starts with the staff. “It’s taking care of people professionally. My number one priority is to take care of our people first,” he said. Virrey sees the cafe landscape as having been shaped by three major coffee movements in the U.S.: mugged diner coffee, quality coffee a la Starbucks, and specialized cafes like Victrola. Virrey sees himself as part of a fourth wave of coffee entrepreneurs who will take the passion (some might say obsession) for the perfect experience to a new level. Meanwhile, the Matte&Gloss effort isn’t the only Liberty-rooted, next-wave food and drink concept working its way up. CHS told you about Alex Negranza’s An Evening With dinner start-up last year. You can follow Matte&Gloss on Facebook or on twitter @Nik_Virrey. Speaking of ultimate drinking experiences, Bauhaus is back open in a (temporary) new home on E Pine. More pictures on the CHS Facebook page. Keep your eyes on Broadway. With liquor license approved, Montana’s Mexican cousin Nacho Borracho is due any day now. Nacho would mean yet another of our 24 Capitol Hill bars and restaurants to look forward to in 2014 has hatched. But we also have word of one that won’t. Details soon. I also love the business model – the cafe acts as a community hub. We have an internal family as well as an external family. The dining experience here is unique – people will get up from dinner service and walk back to our tiny kitchen uninvited just to complement us. These moments make up for the 18 hour days. All the things I’ve done wrong are made worth it by that simple ‘thank you’. Until diners stop having to pay for restaurant meals, someone has to have the diner’s back. A critic’s job is assessing a restaurant’s effectiveness—not the chef’s good intentions. When he reports on the latter he may be a crack reporter, a killer storyteller, a card-carrying member of the food-loving elite…but he’s no longer the critic. He’s subtly shifted allegiances, now telling the story the restaurateur wants told. At the risk of draining every drop of romance out of the world’s most coveted post, restaurant critics are ultimately consumer advocates. Super well-fed ones. CHS doesn’t really do reviews and we’re pretty sure the world is just fine without them. “Food Truck Cookoff” to benefit E Madison’s Hearing, Speech & Deafness Center. Did you watch the game in one of these Capitol Hill bars and restaurants? Who had the best nachos? Juicebox informs us there are still seats lefts for the Mike Easton-helmed Sicily by the Sea dinner on February 8th. Von Trapp’s will be celebrating its first birthday on Sunday, February 9, with beers, brats, and of course: the classic sounds of the Bavarian Village Band. Doors open at 10am for brunch and happy hour drink prices will be in effect all day long—that means select drafts and house wines for $4 and $8 cocktails. Pretzels will be only a buck, too. And chef Pete Fjosne will be making a special anniversary sausage! At 4pm, bar manager Doug Wargo will be tapping an extra special keg of Firestone Walker’s 17th Anniversary Barrel-Aged Blended Ale—a complex beer that blends the flavors of seven different beers and 220 oak barrels into something far more than the sum of its parts. Pints are $5 for Stein Club Members, who also get first dibs on this killer beer, and $8 for non-members. The party really gets swingin’ at 4pm when the Bavarian Village Band goes on—they’ll play their traditional tunes till 7pm. Did you buy Olivar yet? Another Liberty alum, below. Can you spot him? No, not Macklemore? Thanks for the mention on my article with Ericka Burke! I’ll be publishing additional interviews with Jason Stratton or Cascina Spinasse and Aragona as well as Renee Erickson of The Walrus and the Carpenter and The Whale Wins in the next week or two.